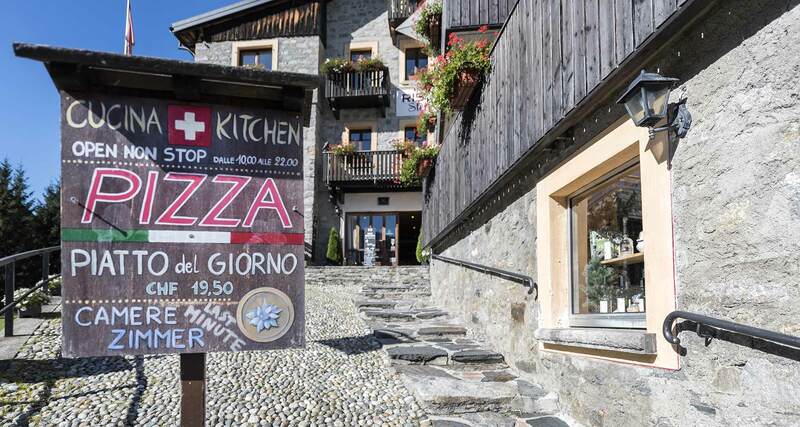 Stella Alpina is a small chalet immersed in a truly unique paradise setting. It is located at the Val Bedretto, a few kilometres from the St. Gotthard Pass and extremely close to the Nufenen Pass. While the zone is covered by an ample blanket of snow in wintertime (in fact, the area has the highest snowfall in the European Alps), in the summer expanses of flowered meadows stretch out as far as the eye can see. While out walking in the surrounding area it is not uncommon to come across wild animals such as roe and red deer, ibex, marmots, and foxes. The hotel boasts an age-old tradition. Built in 1898, it was completely renovated in 2010 while keeping intact its ancient character of a typical mountain chalet. In the salvage work, for example, we chose to restore the original larch, which now covers the walls of the restaurant and the grand fireplace. The restaurant and rooms, furnished in a simple but warm and cosy manner, enjoy a spectacular panoramic view over the entire valley. For your relaxation needs we have the Wellness Area, equipped with a sauna, large Jacuzzi, and corner dedicated to various types of massages, without forgetting the fitness area, where you can keep up your training during your stay at the chalet. Our staff and chefs are at your complete disposal for any assistance and advice you may need to make your holiday an unforgettable experience!